Geobooking is a low-cost multi-squad georeferenced booking system particularly useful for companies that need to perform tasks like delivery, repairing meeting and so forth, on various part of the city, state or nation in a defined time. 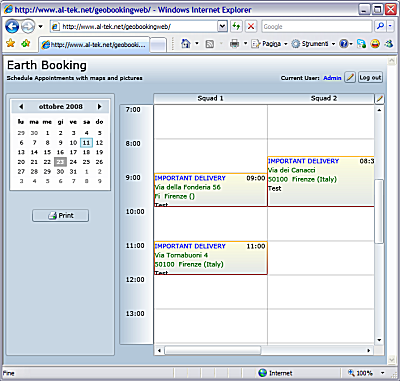 The Idea of GeoBooking is simple, once you access your space using username and password you can start take bookings for your team or drivers at specific time, dragging over cells of the main grid and typing the destination address. This solution can be very useful even for small companies that cannot invest on big and expansive system because you pay for the rent, (30 euro x month) obtaining a high-level service. Low cost rental, (30 euro x month up to 10 squads).